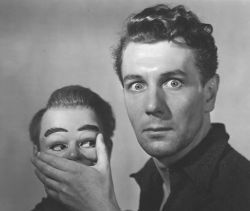 1945’s Dead of Night. I believe that this is the greatest horror film ever made. horror genre, but you’d be dead wrong. that. Most horror films are awful beyond words. amount of serial killers. This film operates on chills, not spills. understated film. The four other stories are much more subdued. There’s the one about the little girl playing hide and seek in a strange house. should contain the classic ghost story, shouldn’t it? golfers who play a match to decide which of them will marry their mutual love. perfect mix of the two elements horror needs—creepiness and cosiness. moment is spookier than any amount of axe-wielding maniacs. he ceases to be a gentleman.”.